T-minus 3 days until Christmas & we’re letting the wrapping presents marathon begin! UPDATE: If you’ve been reading SimpleStepsForLivingLife for a couple years, you’ve seen this before. I love to remind people of this back saving way to wrap presents each year. 🙂 And this year here’s an extra hint from my mom… If you don’t have fancy tags for your presents, no worries! Just use some construction paper and a large rectangle and a smaller rectangle, glue or tape these together and tah dah! Cute little gift tags on a budget! My parents have come up with a great way to save your back during a Christmas present wrapping marathon. They use an ironing board adjusted to their height so their back doesn’t hurt. Is it just me or do those scissors look like Rudolph? Set up your ironing board in front of your couch. Place all presents, wrapping paper, tissue paper, and bags on the couch. Adjust the ironing board to a comfortable height. Place markers and gift tags in Ziploc bag and safety pin to the ironing board fabric cover in an out of the way spot. Put the scissors and tape on the wide end of the board. Place a trash can under the ironing board for easy cleanup. 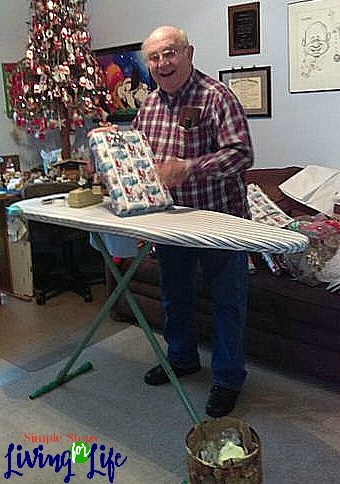 If you set the ironing board up in front of a TV with a football game, even your husband might be willing to wrap presents! (My mom has so many marriage tricks up her sleeve after 50+ years. LOL) See look how happy my dad is! PS Thanks so much mom and dad for these tips and photos. Love you! 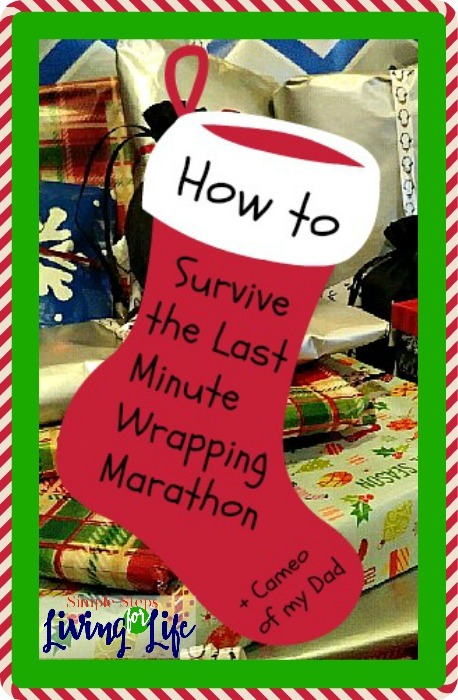 What are your tricks for saving time, money, and sanity when wrapping presents? Now this is just about the best tip ever for wrapping gifts! 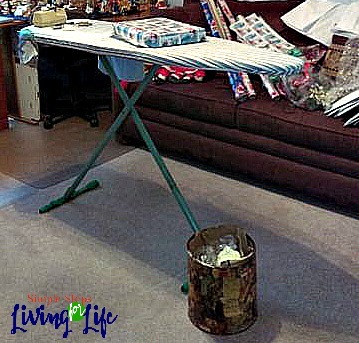 The ironing board idea is genius and beats the floor or table any day! Thank you all!